순환기나 신경과 문제로 와파린을 복용하는 환자중에 급성으로 위장관 출혈이 있어 입원하는 경우가 있습니다. 이럴 때 INR 6이고 hematemesis가 있어 응급내시경을 해야 하는데, Clip 이나 다른 지혈제 주사를 하는 것만으로도 INR이 높기 때문에 새로운 출혈을 일으킬수 있을 가능성이 있어 염려가 됩니다. 1) 이렇게 INR이 높은 환자에서 급성 출혈이 있어 응급 내시경을 할 때 vitamin K, FFP를 모두 주고 응급 내시경을 하시는지요? 아니면 INR수치에 따라 vitamin K 만 주사하시는지요? 2) INR이 높더라도 급성 출혈이면 응급 내시경 지혈술을 위해Clip 이나 다른 지혈제 주사를 해야하는 것인지요? 아니면 vitamin K, FFP를 주고 INR이 보통 얼마 이하가 될 때 응급 내시경 지혈술을 하는 것이 좋을지요? Active GI bleeding 환자에서는 내시경 전 warfarin 중단과 함께 INR 교정이 필요하다고 생각합니다. 실제 ESGE guideline (Endoscopy 2015) 에서도 출혈시 PT INR 2.5 미만으로 내시경 전 교정하라고 되어 있습니다. 교정하는 방법은 FFP 또는 Vit K 또는 둘을 함께 줄 수 있을 텐데 환자 상태 등에 따라 결정해야 하겠습니다. 만약 INR 6 이고 hematemesis 를 한다면 빠른 교정이 필요할 테니 FFP (+ Vit K) 를 줍니다. 문제는 INR 이 충분히 교정될 때까지 기다려야 하는 건데, 환자 상태와 내시경 의사의 경험에 따려 결정될 수 있을 것 같습니다. 만약 저라면 active bleeding 상황에서는 경험적 수혈을 하고 (FFP 1-3 pack) 우선 내시경을 시행해 볼 것 같습니다. 출혈 병소의 성격에 따라 당장 내시경적 지혈술이 필요할 수도 있고 INR 교정만으로도 좋아질 수 있기 때문에 추가 치료 방침을 빨리 정할 수 있기 때문입니다. 내시경 치료법의 종류는 INR 이 어느정도 교정되었다고 생각되면 크게 영향받지 않을 것 같아 병소의 성격과 내시경 의사의 기술에 따라 정하는 것이 좋겠습니다. 구체적인 답변은 못 되었지만 어느정도 개인적인 의견의 느낌이 전달되었으면 좋겠습니다. 감사합니다. 삼성서울병원 이혁 교수님께서 와파린 사용 환자의 내시경 지혈술 관련 분석을 한 적이 있다면서 관련 논문을 알려주셨습니다 (Shim CN. Am J Ther 2016). 이혁 교수님께서 연세대학교 재직 중일 때 연세대학교 신촌 세브란스 병원 자료를 분석한 결과였습니다. Is Endoscopic Therapy Safe for Upper Gastrointestinal Bleeding in Anticoagulated Patients With Supratherapeutic International Normalized Ratios? The management of upper gastrointestinal bleeding (UGIB) in anticoagulated patients with supratherapeutic international normalized ratios (INRs) presents a challenge. 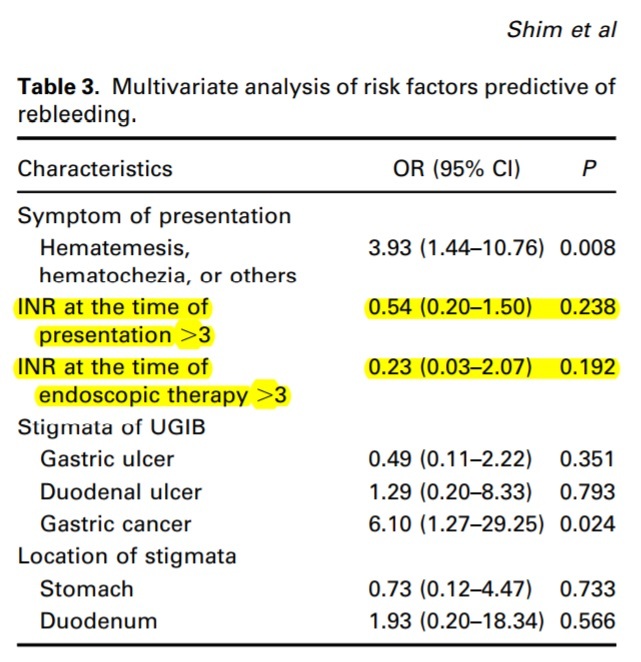 The purpose of the study was to evaluate the safety of endoscopic therapy for UGIB in anticoagulated patients with supratherapeutic INR in terms of rebleeding and therapeutic outcomes. One hundred ninety-two anticoagulated patients who underwent endoscopic treatment for UGIB were enrolled in the study. 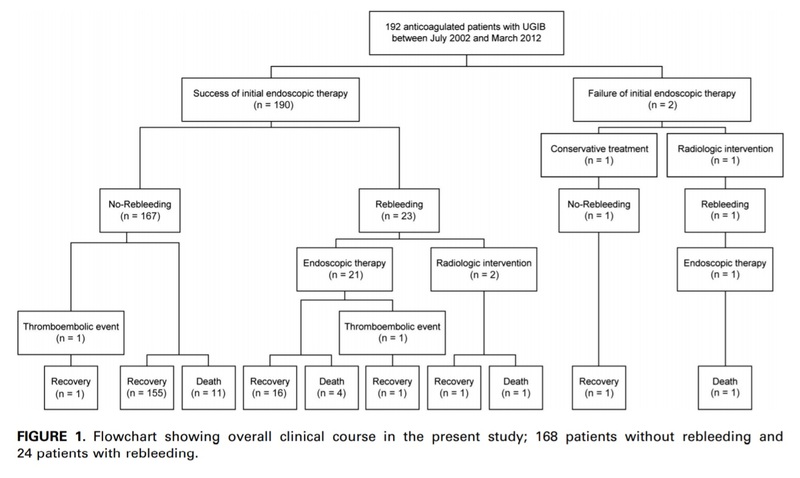 Patients were divided into 2 groups based on the occurrence of rebleeding within 30 days of the initial therapeutic endoscopy: no-rebleeding group (n = 168) and rebleeding group (n = 24). The overall rebleeding rate was 12.5%. Bleeding from gastric cancer and bleeding at the duodenum were significantly related to rebleeding in a univariate analysis. Multivariate analysis determined that presenting symptoms other than melena (hematemesis, hematochezia, or others) (odds ratio, 3.93; 95% confidence interval, 1.44-10.76) and bleeding from gastric cancer (odds ratio, 6.10; 95% confidence interval, 1.27-29.25) were significant factors predictive of rebleeding. Supratherapeutic INR at the time of endoscopic therapy was not significantly associated with rebleeding in either univariate or multivariate analysis. Significant differences in bleeding-related mortality, additional intervention to control bleeding, length of hospital stay, and transfusion requirements were revealed between the rebleeding and no-rebleeding groups. There were no significant differences in therapeutic outcomes between patients with INR within the therapeutic range and those with supratherapeutic INR. Supratherapeutic INR at the time of endoscopic therapy did not change rebleeding and therapeutic outcomes. Thus, we should consider endoscopic therapy for UGIB in anticoagulated patients, irrespective of INR at the time of endoscopic therapy. 와파린 사용 환자가 출혈을 하였을 때 어떠한 경과를 보이는지 잘 보여주는 자료(재출혈률과 사망률 등)라고 판단되었습니다. 좋은 자료 알려주신 이혁 교수님께 감사드립니다.